On the occasion of International Day Against Drug Abuse and Illicit Trafficking, Itanagar Capital Police team organised campaign by Hanging Banners at various locations , distributing Pamphlets at Gompa Mandir, IG Park, Bank Tinali and Ganga Tinali. Beside this , at C Sector School Itanagar in presence of 100s of Students and school teachers, a team of Capital Police made an awareness campaign and gave a short speeches about how drugs are dangerous to the human life specially to the youths. Police team also distributed a sweets to the school children’s and wishing them for their future. 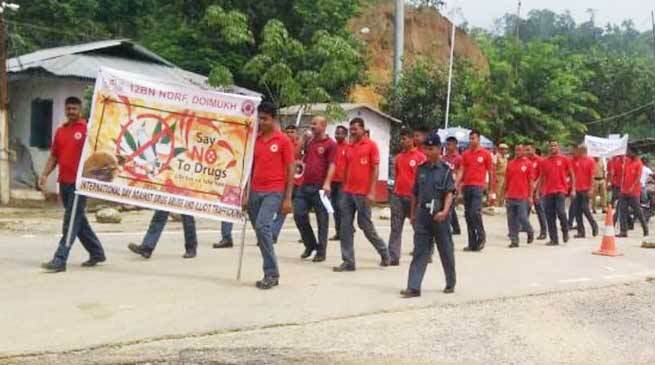 At Hollongi an Awareness rally was organized by D and F Company of 12th Bn NDRF Hollangi on the occasion of International Anti Drugs Abuse Day. The rally was led by Inspector GD Indra Singh Bisht, and ASI Sunil Kumar along with 115 NDRF personnel. They police team dvice the students to stay away from use o drugs and also highlighted ill effects of drugs . Speaking on the occasion Inspector GD Indra Singh Bisht said that the aim of these programs was to create healthy environments among the people, students through awareness rally, campaign at community and School and also aware to local people and community about abuse of drug. Further he also appeals the people not to use drugs and protect himself from ill effects of drugs and safe the future. And voice against drugs abuse to eradicate the drugs abuse from country. In addition to Company has also conducted Swachh Bharat Abhiyan in the area.